ROUND ROCK, Texas | Nothing much ever happens on minor league media days. There are head shots, of course, and some videos, and most players will talk with local newspaper reporters or television sports anchors. Afterward, the team hangs around for an afternoon practice, some infield, a couple rounds in the cage. And upstairs, in the front offices, there are meetings. At the Dell Diamond, across the street from a railroad that still runs regularly, all the minds that drive the Round Rock Express are together for one more meeting before opening day. Dave Fendrick, the new team president, is here. So is George King, the general manager, and Laura Fragoso, the vice president of marketing. Clint Musslewhite and Larry Little, alliteratively named like all the most memorable baseball characters, are here, too. Musslewhite is the director of entertainment and promotions, and Little handles communications. Together, they have a hand in just about everything you see in the stadium. A handful of others are in a circle of chairs up in the enormous press box. They sit around an open space, no table, about 20 feet across. There are good acoustics, so nobody has to shout, but the area still feels enormous. Maybe everything really is bigger in Texas. The Express managed to cram an affiliate switch, a logo switch and a managerial and staff switch all into a single offseason between September 2010 and the next opening day. That might not sound like much, but in a game as entrenched in culture and continuity as baseball, it is. “We talked about ‘Deep in the Heart of Texas,’” Musslewhite says. “We play that during the game, typically,” Little says. “I think whatever we play has to be high energy,” Musslewhite says. “I think if we play something about Texas, it will be better,” King says. “They do play ‘New York, New York’ after Yankees games,” Musslewhite says. Then they toss out more song ideas, not all of them serious, before the talk turns to bands and bunting and color guards and parades and player introductions. “Iowa is in town. Introduce their coaches, then their bench players, then their starters?” “Yes.” “Same for the Express?” “Yes.” More than 90 minutes of festivities are planned in reverse, from the time the first batter of the season steps in to face the first pitch back to the time the gates open at 5:30 p.m. There are small kinks to iron, but only small kinks. 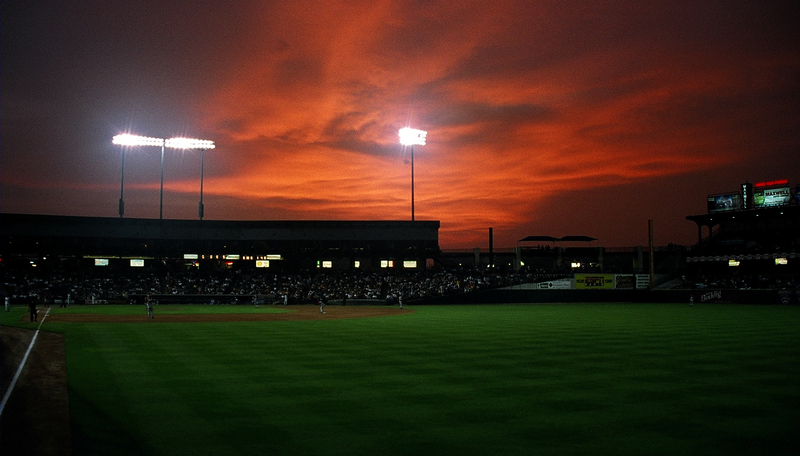 This is not the first time Round Rock has unfurled an opening day spectacular, just the first time after an offseason packed with an affiliation switch, a logo transition, and the formal introduction of a staff of coaches and a roster of players that had never spent a day with the team. A new season is days away. For the people in this press box this morning, it started seven months ago. Baseball has no real offseason, not with six months of games, a month of playoffs, the Winter Meetings, winter leagues, instructional leagues, spring training and another turn of the calendar. But at least some minor league teams can recharge with shorter days and fewer responsibilities between, say, Labor Day and Christmas. That was because the Express managed to cram an affiliate switch, a logo switch and a managerial and staff switch all into a single offseason between September 2010 and the next opening day. That might not sound like much, but in a game as entrenched in culture and continuity as baseball, it is. Consider that the affiliation switch brought a new system of players to Round Rock, with new names and stories and statistics and evaluations. Everything the Express had accrued during their decade with the Astros was worthless. They were with the Rangers now. They had to learn how the team wanted to develop players, who might be ready for a call-up, even some new scouts. Every team has a different philosophy about player development, and every team handles its players differently. The Astros and the Rangers play in the same state, but they have little in common in their minor league systems other than the fact that they both want to develop as many players as possible. The managerial staff switch also resulted in extra work, much of it related to the fact that the Express had little prior relationship, if any at all, with any of those men in uniforms now hired to run their team on the field. But the major switch, especially for all the folks in that media day meeting, was the logo. From Reid Ryan, the son of Hall of Famer Nolan Ryan and the founder and CEO of the Express, on down the chain of command, the team staff looked at the affiliate switch as an opportunity to rebrand the team with a new logo, new colors, new everything. They understood the power of a positive image. They wanted to start fresh with the Rangers. Ryan and the Express worked with Dan Simon of Studio Simon, based out of Louisville and among the top design firms in sports, especially the minor leagues. “His logos are very simple,” Fragoso says, “but he really has a mind to seek out all the differences you have to use a logo.” Simon worked with the club through rounds of revisions until the logo started to form — a prominent cowcatcher to symbolize the railroads and their history, enough baseball stitching to erase any doubt about what sport the Express play, a state flag split in the background. The logo is symmetrical, which eases the work to produce graphics for the video board. It features red, white and blue, the same color scheme as the parent Rangers. One staff member even commented on how the primary cap logo, referred to internally as the E-Train, looks strong on T-shirts, almost like a Superman logo. Team officials wanted to introduce the logo around Thanksgiving, so plenty of new merchandise would be available in time for Christmas. The logo was still in development around that time, though, so the team waited until the start of spring training. No use in introducing it, Ryan says, if it wasn’t finished. The team also needed to replace every old logo — a taller, skinner stylized E-Train that wasn’t symmetrical and was more difficult to incorporate in just about everything — at Dell Diamond and all over Round Rock and Austin. “You don’t realize everywhere your logo is until you go and change it,” Musslewhite says. “It was even on the back of 200 taxis in town, which is great. You just have to change those 200 logos.” With days remaining until the first home game of the season, Fragoso still pulled in others to walk the stadium with her and search for old logos. On the morning of the meeting, about 40 remained, including one that was tiled at the bottom of a pool. The offseason never did end. Everybody in baseball has a story about how they started in the game. This is the story Dave Fendrick tells about that glorious day. “In December 1973, I was sealing blacktop in Columbus, Ohio, and Cal Burleson, who’s now the president of the Indianapolis Indians, goes to the Winter Meetings in Houston. We were in school together. We weren’t great friends in school, as I recall, but we might have hung out a little bit together. He calls me up afterward and says, ‘I got a job, I’m going to Jacksonville, and I heard about three other openings. One’s in Texas, one’s in Indiana, and one’s in North Carolina.’ So I wrote all those teams cover letters and mailed them my resume. Media day starts in earnest at 10:22 a.m., minutes after the end of the meeting and hours before any media will actually pull into the parking lot. Zach Reed, the son of a Rangers trainer who worked four years in the Major League offices and is in Round Rock for the season, is cutting and laminating 64 season credentials. Not all of them will be used every night — few major league teams even have that level of regular media crush — but Little and the rest of department want to have them ready. Better in the minors to always promote your product. After a morning next to the printer, collecting sheets filled with rosters and game notes, Little, Reed and Tim Jackson, the community relations manager, head out for a quick lunch at a fast food restaurant called Chicken Express. The chicken is fresh, not too chewy, the tea is sweet and the man behind the counter starts a conversation with the three almost as soon as they walk in the door. They talk about the season. There is some mention of tickets. In 20 minutes, the food is finished and the car is full again with baseball men. When they return to the stadium, Musslewhite heads to the indoor batting cages, where a camera crew will film players swing comically slow for video board footage. One player asks if he needs to wear a batting helmet. “We want it to look authentic,” Musslewhite says. The helmet is oversized, the style New York Mets third baseman David Wright has worn since a pitch hit him in the head a few years back. The player pops it over his ears. “So you look like you’re in Little League,” Musslewhite jokes. A few minutes later, Musslewhite walks about 80 yards along the outfield wall to the home clubhouse. There are 28 stalls, each filled with about two dozen hangers and a folding chair. A couple of couches and outdated chairs are pushed to one side to make room for a white sheet as big as a concessions stand. An independent photographer named Chuck Murphy is ready to shoot everybody on the team. “How about kneecaps up?” Musslewhite responds. About a minute before the first players walk in, Musslewhite checks his notes and asks Murphy if he plans to take a head shot of each player with his cap and another without his cap. The first minor league game Reid Ryan watched was the first minor league game he played in back in 1994. When your Dad is a Hall of Famer, you spend most of your summer nights in Major League clubhouses. But Ryan never pitched in the Majors or coached in the Majors or did just about anything in the Majors other than grow up immersed in their culture. He did pitch in high school, then in college at Texas and Texas Christian. He inherited enough of a live right arm to land him a spot in the 17th round of the draft 18 years ago — just not live enough to get him any higher up the ladder than High-A. In two seasons in the minors, he pitched for Hudson Valley, Charleston and Visalia, and struck out a little more than just one batter for every one he walked. He watched his ERA climb to 6.04. He realized pretty quickly he might need to find another career. Thanks to a life in the game and enough connections to know who might want to sell off a minor league team, Ryan had a handshake deal within months to purchase the old Double-A Jackson Generals in Mississippi and move them to Texas, had raised the $5 million in necessary capital to buy the team and had landed a municipal deal in Round Rock that funded half of a stadium. Less than two years after that, the Round Rock Express played their first game, and Ryan, just weeks shy of his 29th birthday, was the founder and CEO of a Double-A baseball team — exactly one level higher than he ever pitched. The Express have always succeeded, setting attendance records for Double-A clubs during each of their first four seasons and often drawing more fans than most Triple-A teams. Ryan has played a big part in all of that. People who have worked with him for years talk about his vision, how he can find a sliver of greatness in the smallest detail, how he can still always keep the bigger picture in focus. So many pitchers are cerebral, happy to analyze their work on and off the mound, and though Ryan hasn’t pitched in 17 years, he is still a pitcher. He still has an incredible mind. Thanks to that mind, the early success for the Express and an ownership group that includes the pull of Nolan Ryan — worth the power of his famous fastball just about everywhere in the state — and the business acumen of Don Sanders, Ryan was able to turn that success into a bit of a Lone Star baseball empire. In 2003 he purchased the old Triple-A Edmonton Trappers, moved them to Round Rock to join the Pacific Coast League, then moved the Express to Corpus Christi, where he had founded another team, the Hooks, to replace the Express in the Texas League. Not a bad legacy for a guy who pitched all of two seasons and is still hardly old enough for a midlife crisis. Everybody in baseball has some favorite promotion, but not many have one wilder than Larry Little. This is the story he tells about a literally unforgettable night. “Reid came to Clint and me during spring training and let us know that Will Ferrell was coming for a game and wanted to do something. Reid had the idea to do something about a Latin pitcher, so Clint and I brainstormed for a while and developed the Rojo Johnson backstory -- born in America, moved to Venezuela during the oil crisis of ’91, arrested for smuggling exotic reptiles. He was all for it. We grassrooted it, put some random links on YouTube, had a Wikipedia page until it was taken down because we didn’t have any verifiable sources. We got some interviews with some of the scouts that were out at the park. ‘Rojo Johnson? Oh, yeah, I remember him. Where is he these days?’ The scouts were great. That did not sit well with the Astros. “Will was going to be here for a Thursday night game, and we released the information on the Monday before. It picked up nationwide pretty quickly. One radio station in Seattle, the day of the game, did an afternoon commentary blasting the Mariners for not signing Rojo, saying he was the kind of player they should be going after. Will showed up before the game, he got out of the SUV, looked at me, shook my hand and said, ‘You must be Larry.’ Real genuine. He came out in the sixth inning with a glove and a six-pack of beer. I remember Reid wanted him to have a cat in his jacket and someone to bring a snake out to him on the mound. We just said, ‘Reid, c’mon, a cat and a snake together out on the field? That’s just asking for disaster.’ He brushed back the one batter he faced, was ejected and started running around the outfield, and the whole bullpen came out and chased him. I was afraid it was going to take too long, and it took longer than we expected, but no one was upset. Reporters and camera operators from a couple of local television stations walk into the stadium a few minutes before 2 p.m., and by 2:12, Little is watching the first interview of the day. All the reporters want to know about two or three players, the big names, the names they all recognize, the names their viewers have been conditioned to think about as the Rangers of the future. He has a stack of “Hello My Name Is” cards in one hand, an appropriate accessory for a new season with a new team filled with new players and new coaches from a new affiliate. Especially considering the Rangers finalized the Express roster days ago, Little has learned names, faces and facts surprisingly quickly. He did spend part of a week out in Surprise, Arizona, the spring training home of the Rangers, and he met all sorts of organizational players and staff there in the dry March heat. He had a pretty good idea even then who would probably start the season in Round Rock. Little is a Baylor alumnus, a minor league media relations veteran of almost a decade, a published writer with short stories on his resume and half a dozen unfinished screenplays in various degrees of completion. Also, he plays in two bands. He has been around the game long enough now to analyze its nuances, and he knows that most media days are relatively tame, especially when the closest Major League team is opening its season at the same time just three hours north up I-35. The Rangers are up on the video board, the pictures as big as a movie screen, the sound of cheers bouncing out of the speakers. They went to the World Series last fall and, even though they lost, here they are now, receiving their American League championship rings. The effect of watching a packed stadium on the video board of a stadium that doesn’t have a single fan in the seats is sort of incredible, like something out of The Twilight Zone. Little scans the field. Not one player is talking with a reporter. Every head is turned up toward the board. Everybody wants to be there, either to receive a ring, or to cover a championship team, or just to experience a packed house on opening day. The last interview ends 36 minutes later. Standard questions today, nothing all that deep. You never get to know players on media day, you just get to find out what they look like in a uniform. Today, Reid Ryan owns a pair of minor league baseball teams along with the rest of the Ryan-Sanders group, and he has no plans to move either one of them. He’s happy in Round Rock and Corpus Christi, and his family will probably never leave Texas. They have homes and ranches, and his Dad owns a share of the Rangers, and then you have that whole living legend thing. “We live in this state,” Ryan says. “We’re not moving from this state, and we aren’t going to go to a community, convince the taxpayers to build a stadium and then turn and burn it. We told both cities we’re here for the long haul, and that wouldn’t be our style. Texas loves its football, of course, but the state has learned to love its baseball, too — and Ryan and his family have helped spur the renaissance. There are no more major changes for the Express now or during the next couple of years, at least upstairs in the front office. Ryan is planted. So are Fendrick and King, whom the team lured back after he had left the Express for another team and almost immediately wondered why. The rest of the front office is stable, a foundation to build on for years, and Round Rock is still among the top draws in all of the minors, one of just three teams to tally more than 600,000 fans each of the last two seasons. Texas loves its football, of course, but the state has learned to love its baseball, too. Both of its Major League teams have played in a World Series the last decade and have been smart enough to keep at least a few of their affiliates in and right around Texas. Ryan and his family have helped spur the renaissance — which started thanks to that poor minor league career and blossomed after that quick career change to ownership, and sustained now with a growing collection of teams. How can the Express continue to improve? There are limited possibilities on the field other than sustained success in the standings and in player development. The Rangers have drafted, traded and developed well, with players like closer-turned-tentative-ace Neftali Feliz and shortstop Elvis Andrus coming up through the system to reach Arlington, and prospects like shortstop Jurickson Profar and left-hander Martin Perez still climbing the ladder. In the seats, they can just continue to attract fans, more than 600,000 of them, year after year after year. Ryan started something here in the heart of Texas, and a lot of people have helped him build along the way. Everybody in baseball has some ridiculous story about the game. This is the story Tim Jackson tells about his first media day. “Do you remember Gustavo Chacin? The pitcher with the glasses and the bald head? On media day a couple of years ago, I walk into the clubhouse, which can be a little intimidating, and ask everybody to put on their tops and their caps for a head shot. Everybody stares at me for a little bit, like pulling teeth, so I step back out. Finally, they start to move, and it takes longer than expected, but they do it. I go down the list, and most guys have gone in for head shots, a few guys are still in the trainer’s room, and then there’s Gustavo Chacin.